A feast that even an Italian mother would approve of! Attractively packaged in a beautiful wicker gift basket. 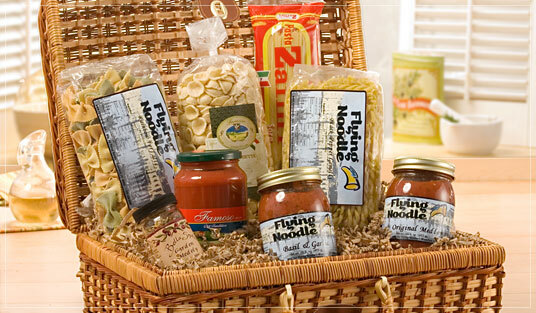 Flying Noodle gourmet gift baskets have been the gift of choice for thousands of customers since 1995. Experience the difference of a truly gourmet experience when you order any of our gift baskets, gourmet combos, or monthly gift clubs. And remember, every item we sell is backed by our 100% Satisfaction Guarantee. If you're looking for the best of the best, you've found it! Flying Noodle - The original gourmet gifts.